Jackson Heights, home to a thousand and one different ethnic eats, has a bunch of halal carts. My friend Jeff, of Jeffrey Tastes - Queens Qustodian, had the brilliant idea of a Halalathon. 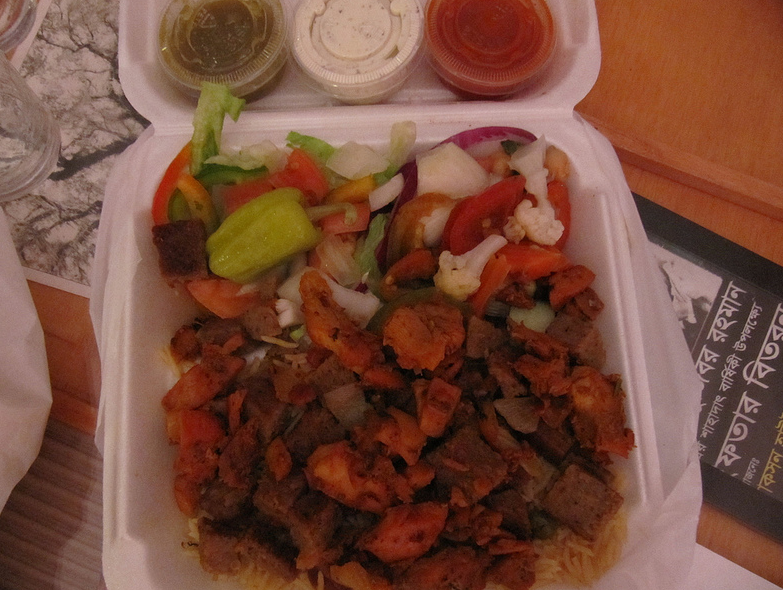 We would try all the halal carts in one night and compare them. I had never tried the halal food in Queens and thought it would be a great opportunity to gain a greater understanding of them and appreciate their flavors. The word on the street was that the Gyro King in Jackson Heights had the best Halal food. Was it a rumor, an award, or fact? We were to find out at Halalathon. Last night, my friends and I decided to tackle five of the carts and compare them to two restaurants Gyro King and American Chicken. The rules of Halalathon were simple. Everyone was to buy a chicken and lamb combination platter over rice with sauce on the side. We would then do a taste comparison of each dish. 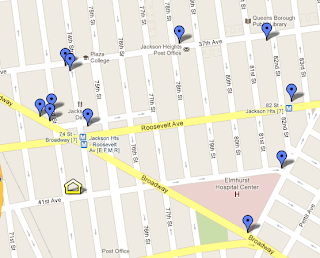 We created a map on Google Maps pinpointing the location of the carts. The majority of the carts were clustered on the corner of 37th Road and 73rd Street and a few were around the corner at 74th Street and 37th Avenue. We met in front of Kebab King, split up to buy food, and then met up at Tastes Village in Jackson Heights to eat. The dishes were varied and none looked identical. I was a surprised that they were so different compared to the Halal cart food I bought in Manhattan. In Manhattan, the combination chicken and lamb over rice or salad were always the same color, same look, and same taste. 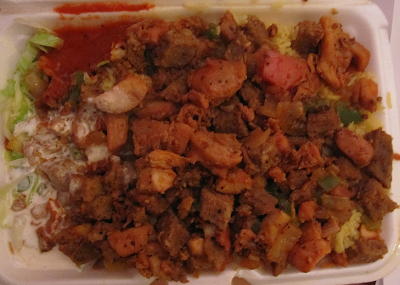 In Jackson Heights, the halal cart food looked and tasted more specialized. This got me thinking. What was the definition of halal food and was it more than just chicken and lamb over rice? It is the type of meat supplied to the carts and there was much more than just chicken or rice. Some carts had hotdogs, hamburgers, samosas, and Philly cheesesteaks. The hot dogs were especially popular among the Muslim and Indian children. There was often a line at each cart. Of all the carts we tried, only one was a recipient of an award, the Vendy Award. Sammy Halal Food was voted best food cart in 2006. Our collective notes determined that while Sammy may have an award tucked under his belt, his food was not necessarily the best. We voted the cart by TD Bank on 74th Street and 37th Avenue #1 for the night. A well balanced plate was the key. I had watched the man cook. The lamb started out as a patty. He then chopped it up and while the chicken and lamb were cooking he sprinkled seasoning all over. I have no idea what was in the seasoning but it sure made the dish good and tasty. As I had mentioned earlier, each cart was different. 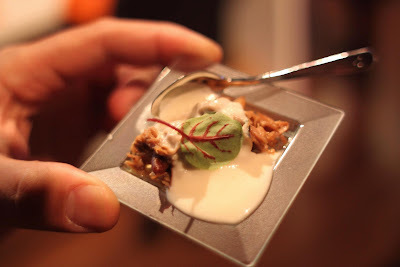 They were varied in presentation, taste, and ingredients. Some used Basmati rice, some were oilier than others, and one, American Chicken used Mexican rice and it was extremely bland. 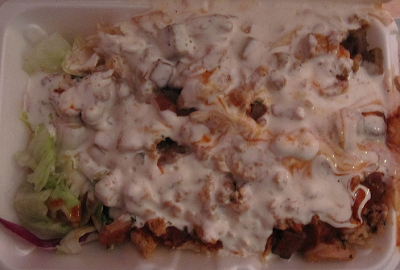 American Chicken even gave sour cream and jalapeno sauce. They were the worst tasting of the bunch, dry and flavorless. Gyro King was also a tad bit disappointing. Their salad consisted of pickled vegetables and the red sauce was on the sour side. The cart food was best when slathered in white sauce and hot sauce. We concluded that the sauces made all the dishes decent and edible. The best ones and most favored were consumed within minutes. One of my favorite things to do is to explore neighborhoods within a city. While my sister was getting her hair done at a nearby salon in the Outer Richmond, my cousin introduced me to the cutest little pizza parlor Pizzetta 211. It's the type of place that really gives a neighborhood character. How many people can say their local pizza shop can rival one in Italy? It's definitely worth going out of your way for. Pizzetta 211 is tiny and can seat probably 10 people inside and four people outside. It's charming and rustic like a farm house. I really loved it and the service was very friendly. That made a big difference. Going to Pizzetta 211 is almost like sitting down at a friend's house for lunch, extremely casual and relaxed. It feels like home. That includes access to the kitchen. The shelves and food are laid out there. The pizzas only take about 5 minutes to bake. They are thin and small, personal sized, but okay for sharing just as long as you get more than one. We started off with a field greens salad. It was simple, organic, very California (sans avocados! ), and tasty with just balsamic vinaigrette and a sprinkle of salt. Then we moved on to two pizzas (Serrano ham, crescenza, oven dried tomato, wild arugula and Tomato mozzarella basil with pepperoni). Everything was just perfect. One could say that after pizza and salad lunch was done but there is always room for dessert! Despite an early afternoon flight I had to catch at SFO, I decided to get dessert to go after quizzing the waitress what was the deal with the biscuits and fresh strawberries on the counter. 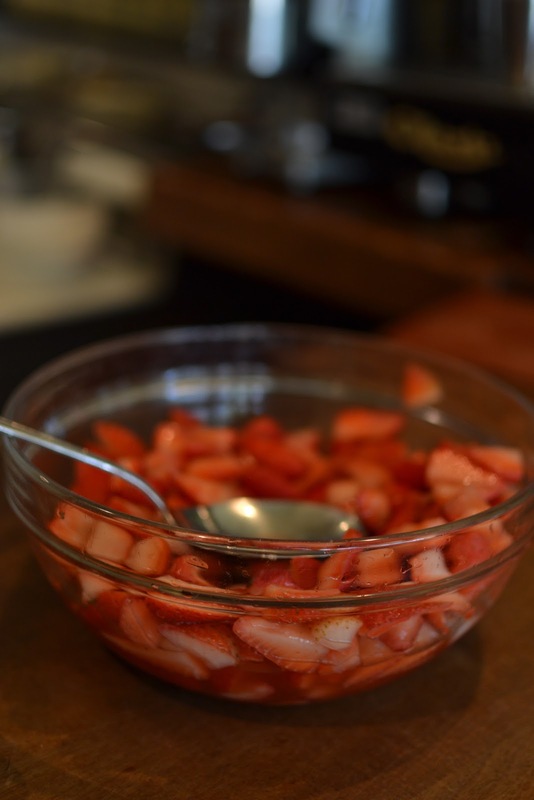 She whipped up together the best warm strawberry shortcake for me complete with whipped cream. Since they didn't have any plastic utensils, she gave me one of their real forks. It was the best feeling to chomp on a strawberry shortcake while zipping through the streets of San Francisco in a Mini Cooper. I wasn't driving of course. Pizzetta 211 is of the best gourmet pizza parlors in the Bay. For sure. This was the note I left on for my quick weekend SF jaunt. Lucky me. Like pie? Dessert? Mashed potatoes and smashed peas? BBQ? Thai chicken? Pie Face, an Australian savory pie and dessert chain, is starting to make its mark in NYC. They recently opened up their second location in Manhattan's Murray Hill. I got to attend their launch party courtesy of Google. It was a smashing event with unlimited tastings of savory pies, desserts, Australian themed drinks, and Australia's specialty cake lamington! I had the opportunity to chat with Owner Betty Fong for a bit. I asked her how pie played into Australian culture. She said she grew up eating these savory snack pies and in Australia they are everywhere. Fong loved them so much she decided to open up Pie Face. The pies are miniature and perfect for small bites. A trio of pies would make for a meal. Get two savory and one sweet and you've got yourself the perfect balance. The pies are cute and coded with faces drawn. The mouth is a letter to designate the type of pie it is. General Manager Warren happy to serve pie! For a heavier option a "stack" is available. A stack is a pie topped with mashed potatoes, smashed peas, and gravy! The sweets are endless and range from apple pies and cheesecake to chocolate mousse and key lime pie. I tried everything and loved it all! Pie Face is a full bakery and cafe as well. I've passed by the Times Square Pie Face location many times before and never took interest. The Murray Hill location is much more spacious but still no seating. Now that I know what Pie Face is all about, I'll be stopping by. Sure beats an American Hot Pocket, that's for sure. The Travel + Leisure Global Bazaar VIP Ticket All Access Pass was like the golden ticket from Charlie and the Chocolate Factory. The ticket granted admission to three days worth of events at the Lexington Armory. These events ranged from a kick off party to a global tourism themed day and one catered especially to families. The Travel + Leisure Global Bazaar literally brought the pages of Travel + Leisure to life. Have you ever dreamed of vacationing in Chile? Mexico? Taiwan? The Global Bazaar showcased many countries by creating mini environments replicating the feel of each destination. The result was far better than an Epcot experience. I can't say if it were close enough to the real thing but I did feel like I got a taste of Barbados, Morocco, and Belize. Each booth and country represented was interactive. Whether it was through food, drinks, customs, or dance, each visitor was given a chance to be immersed into the country's culture and what they have to offer. I was impressed with Puerto Rico. Their draw was an indoor scaled down version of the real life one mile 900 foot zipline through Puerto Rico's jungle. The Travel + Leisure's version was 20 feet high and about 10 seconds lasting. It was quite a thrill. That's me getting ready to zipline. 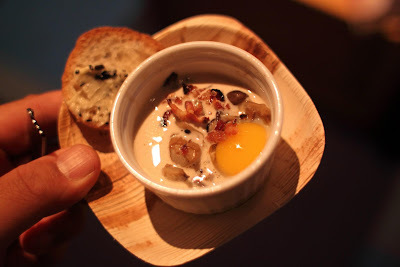 Gourmet food was a big draw to the Travel + Leisure Global Bazaar. Some of New York's finest chefs represented their restaurants. A few even came flew in from around the country. Sunday was the family fun day. Each destination catered to a family friendly atmosphere with activities such as face painting, dance, hair braiding, jewelry making, and live characters. I especially liked the family day as it was calmer, more breathable, and relaxing. In the end, the whole experience left you with rejuvenated wanderlust. Time to start planning a vacation! To the land of Bjork! Why not? Special thanks to Stella Dacuma Schour of Stella Dacuma Schour Photography and Cooking With Stellaaa and Sara Markel-Gonzalez of Under The 7: The Roosevelt Avenue Project for inviting me to be their special guests. Stella won tickets from Girl Gone Travel. It was really nice to finally meet Carol Cain of Girl Gone Travel. I had been following her on Twitter as @nycitymama for the past year.